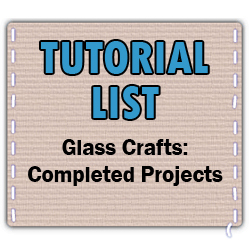 Here is an almost completely thorough list of the tutorials that are available on the Glass Crafts: Completed Projects board. No tutorials listed on other sites were included. If you find another tutorial that you feel should be included here, please reply! If you notice that a link is incorrect or a description is not correct, please let us know that, too. We want this to be as easy to use as possible. Ahhh, I'm the same way! I've used Armor Etch, but I really want to venture into the other techniques. It's always seemed a bit intimidating to me, though... well, maybe until now! Yay tutorials! I have dabbled with mosaics and etching but I want to try more, too. Ooh, awesome! I've been wanting to try mosaics, and now I have something to work off of! And I love Armor Etch. It's so great, and the results are phenomenal! This is a terrific resource! Ooh I love that first tutorial for the light fixture. What a great idea! I love that one, too! A unique way to accessorize a room. Ahh, she makes the light fixture seem so easy! I always love those! Thank you for featuring two of my tuts. If you have not tried glass/mosaics, DON'T! It is addictive. You're welcome! Thank YOU for sharing them! convert any pic into a 3d image to view with red/blue glasses. create and send 3D greeting cards from your pics. Hey all! This is now the full tutorial list for Glass Crafts! Let me know if I've missed anything! Not sure, but I would say do a test on a scrap glass to see if it would work. Rubber cement is an odd substance, and I'm not sure if it would stand up to the etching material. Let us know how it goes!